Around the World in 80 Days by Playrix - Travel back to Victorian times and get ready for spectacular adventures! You only have 80 days to circumnavigate the globe. Think that sounds easy? Travel back in time to the late 19th century and get ready for spectacular adventures on land, sea and air together with the English daredevil Phileas Fogg and his loyal French servant Passepourtout. Use the unique chance to visit four continents and complete the inconceivable journey to win the fantastic 20,000 pounds wager with this outstanding puzzler from Playrix inspired by the classic adventure novel by Jules Verne. 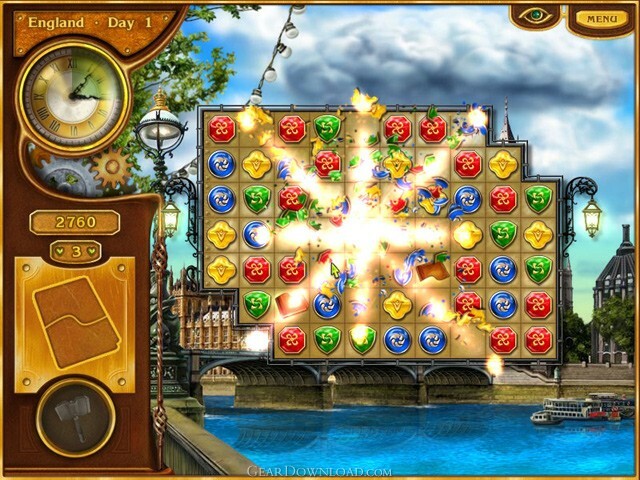 Around the World in 80 Days from Playrix Entertainment is not an adventure game but a match three puzzle game. This game faithfully follows the storyline complete with the characters and locales of Jules Verne's classic novel Around the World in 80 Days. In this game, you swap adjacent tiles to make matches of three or more. You need to drive all the item pieces to the bottom of the game field by getting rid of tiles underneath them. Once the item piece is freed through the bottom of the game field it will be added to the item outline. The level is completed when the outline is full filled. A big clock on the left shows how much time has left to complete the level. By matching four tiles or more you recharge and upgrade the power-ups that will help you free the way for the item pieces. There also have bonuses tiles which can be freed through the bottom of the game way as with item pieces. This download (around-the-world-in-80-days_en_trial.exe) was tested thoroughly and was found 100% clean. Click "Report Spyware" link on the top if you found this software contains any form of malware, including but not limited to: spyware, viruses, trojans and backdoors. Fishdom by Playrix 1.5 - Solve immersive puzzles and create your dream aquarium in this Playrix game! Call of Atlantis by Playrix 1.3 - Collect seven crystals of power to appease Poseidon and save Atlantis. 4 Elements by Playrix 1.5 - Use the magic of the four elements to restore the ancient kingdom to life! Fishdom: Spooky Splash 1.1 - Progress through match-3 levels and create your spooky aquarium. Fishdom: Harvest Splash 1.1 - Progress through match-3 levels and create your harvest tank! Playrix Fishdom: Frosty Splash 1.3 - Get splashed with frosty joy from Playrix! The Rise of Atlantis by Playrix 1.5 - Collect the 7 powers of Poseidon to raise Atlantis from the depths of the sea! 4 Elements Mac by Playrix 1.3 - Use the magic of the four elements to restore the ancient kingdom to life! Fishdom 2 Premium Edition by Playrix 1.3 - Another great catch from Playrix! Around the World in 80 Days Mac by Playrix 1.3 - Travel back to Victorian times and get ready for spectacular adventures!